Today I had a special treat for breakfast; Pulut Durian! It's not so often I can have this meal as the durian fruit is seasonal and I have never come across food vendor selling this in Kuala Lumpur. In the northern states like Kedah and Perlis; yes, it is commonly available at pasar malam (night market). 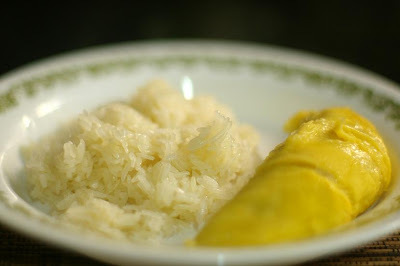 The closest I could find is, Pulut Mangga which is a Thai delicacy however its yumminess is a far cry from its original. Best eaten with the hands, the taste is creamy and sweet; best thing in the world. However beware; according to some the smell of the durian is not very pleasing. Yesterday, as I was making payment at a counter; the gurlfriend and the lady cashier thought they'd smelt propane gas!! Obviously it was not the case as it was only my durian. To me it smell sweet and yummy. the real sweet & sour concoctions! but durian cheesecake ada tau..